ACA Audio Recorder (> 4.0) is a supposedly professional audio recording application which can record audio from several sources from your sound card and from within Windows. Audio input sources may include your PC microphone, online radio stations, internet streams among others. Though we highly suggest a freeware solution for recording audio like Audacity, ACA Audio Recorder does provide support services and promises a lot. 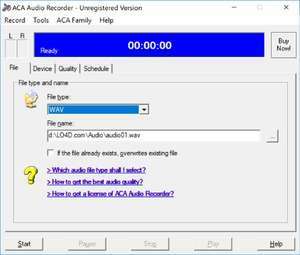 ACA Audio Recorder 4.20 is a shareware program and can be used as a demo to try the software until the free trial period has ended. A full version of the program is available after the trial period ends. For security reasons, you should also check out the ACA Audio Recorder download at LO4D.com which includes virus and malware tests. Additional screenshots of this application download may be available, too.